The release in the States by Light Records of 'A New Day' by Paul Porter brings into the solo spotlight one of the great voices of gospel music. 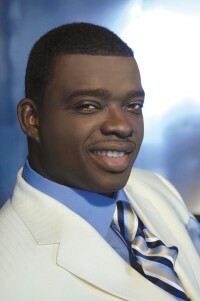 For most of his 30-year-long career in gospel music Paul has been the frontman of the gospel group from Sontag, Mississippi, The Christianaires who went on to win three Stellar Awards and enjoyed such major gospel radio hits as 1993's "Two Wings". Now with his debut solo album, described as "a little bit of the soulful stylings of Al Green, a generous splash of that traditional gospel quartet sound, a pinch of old school R&B and a teaspoon of urban grooves," Paul seems destined to register high in Billboard's Gospel chart. I began by asking Paul whether the title 'A New Day' signified a new beginning away from The Christianaires? He replied, "No, not really. I'm still a Christianaire and I'll be a Christianaire for life - it's a 30 year legacy. At this particular point they're sitting still and not doing anything. The Christianaires faced several situations where the legal aspects of the business paralysed us, it was a bit of a battle with record companies. We were still trying to do dates but it got to the point where we wouldn't work for months at a time. Basically that stagnated the Christianiares' career. We're still working to try and deal with that. At that point God dropped this album in my spirit." Born on 20th August 1962 the youngest child of Reverend Eddie Porter and Ora Porter, Paul grew up in Detroit, Michigan. With both parents committed to the work of the ministry, he shared in their vision to minister even at an early age, beginning his career singing in the church choir. Remembered Paul, "My mother started me singing on Easter Sunday when I was three years old. She put me up on the table at the church and I sung my first song." Under his father's direction, Porter led his first group at just nine years old and became known for his natural vocal ability. After school Paul decided to follow his brother, Tyrone, to Sontag. During their school days the brothers would sing in different quartet groups and together with their cousins, Ronald and Arnold, they formed the original Christianaires. "My father always wanted us to do a little quartet group because he was in a quartet group. He (my father) would get us in the basement and if we got out of key he would pop us upside the head," he remembered with a smile. Before the Christianaires started a recording career, the group spent long hours touring, performing at churches and conventions, as well as doing concerts and spots on television. In 1984 they recorded their first album, 'Ain't No Way I Could Lose'. Over the next two decades The Christianaires recorded numerous other albums including 'Ain't No Way' (1990), 'The Vision Becomes Clearer' (1993), 'Thru The Storm' (1995), 'Reaching Out' (1995), 'Saints Hold On' (1997), 'Thank You' (2001) and 'Best Of The Christianaires' (2002). As well as the Grammy-nominated cover of an old James Cleveland tune "Two Wings" the group enjoyed popularity on the church circuit with explosive, soul-drenching performances. Paul also found time to engage in a solo career touring around Europe and Canada. He also lent his soulful tenor voice to the albums of luminaries like the Williams Brothers, the Original Drifters and the Jackson Southernaires. "I started with Melvin and Doug, and Frank Williams in Jackson, Mississippi, and just around Jackson I ran into a lot of artists. I started playing guitar with the Williams Brothers when they needed a player on some of the same dates. I sang with the Mighty Clouds Of Joy. I interacted with a lot of groups during my 30 year career." Paul shared the stage with the likes of Pastor Shirley Caesar, Aretha Franklin, Lou Rawls, Candi Staton, Kelly Price, the Mighty Clouds Of Joy, the Williams Brothers and many others. He was just as passionate working behind the scenes as he was on stage; writing, producing, and arranging for artists such as New Harvest, The Canton Spirituals and Melvin Williams. In 1996 Porter's career came to an abrupt halt and his faith was tested when he suffered a brain aneurism. As a result of the aneurism, he lost sight, his voice, his ability to walk and motor skills. Said Paul, "It was a wake-up call for me and it gave me a sense of closeness to God although the doctors had given me up to die. I was in a wheelchair for three years and had multiple surgery on my legs. I was in a wheelchair telling people that God was going to heal me and three years later I'd spoken it into existence. Went from a wheelchair to a walker, to a cane and in 2006 was able to get rid of the cane." One contemporary artist who has been influenced by Paul is top selling US R&B star Fantasia. Long before she rose to prominence on the American Idol talent search, Fantasia Barrino was singing in the church choir and watching her father work with groups like The Christianaires. Said Paul, "I know Fantasia has strong beliefs in the Lord. In fact her mother is an evangelist. I went over to her house one day recently. Fantasia was there praying about the whole showbiz thing. She started so young and so much pressure was put on her. She was in a play, The Color Purple, and it was a gruelling schedule and she almost lost it. She had to turn to the Lord and just sit in her room for a few days and ask the Lord to guide her through it. We had a mega conversation. I believe that eventually God is going to call her back to the church full force. I know she's strong in the Lord." Paul's 'A New Day' album features a diverse set of musical approaches. "If there was a style called variety that is the category this project would be in," Paul laughed. As well as giving the gospel quartet sound an edgy update there are some R&B grooves. Commented Paul, "The secular R&B stations play 'Get Away And Pray'. That has a message that could appeal to the non-church goer as well as to the saints. My favourite song on the album is the most testimonial one, 'I Made It Through'. That song speaks to me in so many instances. Even though I didn't write it, I didn't produce it, during the song selection I heard that song and thought, 'Man, they're talking about me, this song is written FOR me!' A young man called Joey Woolfalk out of Chicago who at one point was the band director and guitarist for Fred Hammond, wrote 'I Made It Through'. As a matter of fact he had already recorded the song and then re-submitted it for others to record." Other standouts on the album include "If There's No Tomorrow", a searing duet with one of the pioneers of crossover gospel music Rance Allen while the opener "My Redeemer Lives" is another slice of old school call-and-response fire. Recently Paul was asked what was his most rewarding moment in his 30 years in gospel ministry? He responded, "I think the most rewarding moment in my ministry was for me to go down to get up. And in that I mean I let God show me that if I stay true to him he will heal my body. And that's been of the most rewarding. He brought me back from zero. I was so low as far as sickness, I had to go to rehab and get my speech back, get my feeling back, get my eyesight back, I was paralyzed. God has done a miraculous thing in me. So I think that in my ministry, I have to include that in my ministry, he showed me that what I sing about, about healing and everything, he showed me that 'Paul, you're gonna go through this situation where I'm gonna have to heal you and I'm gonna show you that miracle so you can really sing and testify about what I did for you.'" I didnt like quartet music at all . Until heard you singing with the Williams Brothers. And I have loved it every since and the miracle that God . Done for you my Lord man of God keep serving the Lord inside and out . Your song Ground Zero is so awesome. I love Paul Porter I sit and listen to him sing all day he has the best voice in the world and he is great with all the groups. We have listened to Paul Porter for many years and love him. He can sing it all. The love he has for God comes out in his music. We will continously pray for him. We listen to peace be still with you Carolyn Taylor & The Gospel Legends, Oh And Rev Robert's. The Gospel Station in the town of South Boston Play it for us we don't ever request it he send us a SO for us the ladies at Edmondson's Cleaner's. I love Peace Be Still when I hear it I go right there, We better go get JESUS! I Love to hear Paul Porter sing, you are an Annointed singer of God, continue to do his work, bless you and your ministry. Come to DC soon. I watch your recording of Its You That I Trust with Rance Allen all the time and you are a blessing, you lift my spirits during hard times. I just want to let you know that I love the song "You That I Trust" with Rance Allen. When things aren't going well I listen to the song for hours. May God continue to Bless and strengthen you. Our God is great, no one like him.